Enteralite Infinity Pump Administration Sets, manufactured by Moog/Zevex, is a pump system with security features designed to go wherever the patients go. The Enteralite Infinity Administration Sets features a patented in-line occluder to help with helping prevent the dangerous issue of automatic or free flow of contents. Closed System set features the SpikeRight® PLUS proximal end. This end is designed to be incompatible with IV ports, spikes, and other medical equipment including airway devices and epidural systems. Enteralite Infinity Pump Sets provide easy to use cassettes that allow consistent, one handed loading. Open system set comes with built in hanger and a large top-fill opening. The cap for the opening is leak-proof and helps to minimize formula spills and waste. Use this set for a convenient and safe way to feed your patients. BUY enteralite Infinity bags from Vitality Medical today. With this alone can I feed myself via tube? Thank you for your reply. We can't make any recommendations regarding the usage of products. It's best to speak to a medical professional for proper advice should you decide to purchase this product. The product is as expected. 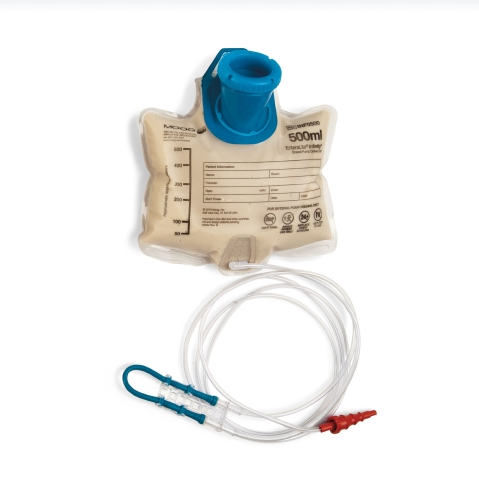 The change in connector mentioned by the other reviewer is due to a change in all enteral products to the Enfit system to avoid confusion with IV products. I am impressed that this company changed the picture to be accurate. The price here is much better than I have found elsewhere and I will continue to buy here. Service was excellent. Very affordable. The feeding bags arrived the next day without havinf to pay extra for shipping. Excellent company.